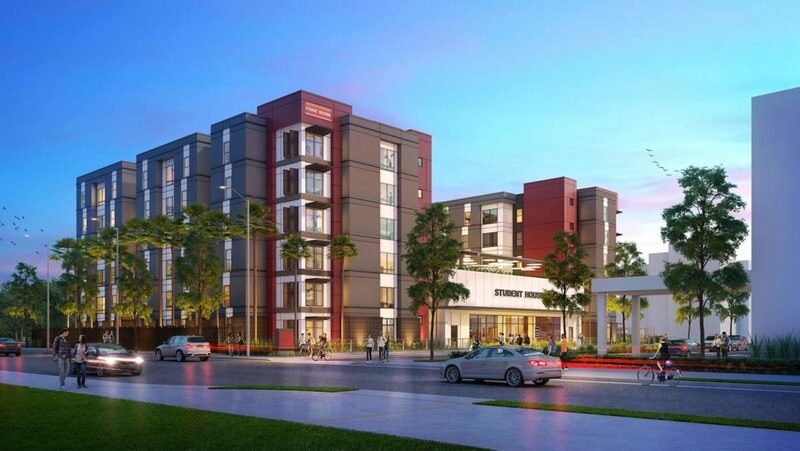 The project at 1630 San Pablo Street will create 272 beds for graduate students. American Campus Communities has broken ground on another student housing development at the USC Health Sciences Campus in Boyle Heights. Grading and shoring activities have commenced at 1630 N. San Pablo Street, where the Austin, Texas-based developer has received entitlements for the construction of a six-story building that will feature 95 units of graduate student housing and 10,000 square feet of ground-floor retails pace. All of the new apartments will be four-bedroom suites, creating a total of 272 beds with central kitchens and shared bathrooms. The new housing, designed by KTGY Architecture + Planning, will incorporate 3,500 square feet of lounges and study rooms, and outdoor amenities including a roof deck and a central courtyard. Completion of 1630 San Pablo is expected in late 2020. The project is the second student housing complex built by American Campus Communities at the USC Health Sciences Campus, following a nearby 177-unit development on Alcazar Street. Both of those projects will flank a 200-room Hyatt House hotel, which is also under construction. ima provided landscape architecture for American Campus Communities on a six-story building with 95 units of graduate student housing and 10,000 square feet of ground-floor retail space at the USC Keck Medical Center. All of the new apartments will be four-bedroom suites, creating a total of 272 beds, 3,500 square feet of lounges and study rooms, and outdoor amenities including a roof deck and a central courtyard.